American Job Centers: There are nearly 3,000 of these centers in communities across the country. Your local American Job Center has lists of recent job openings, computers you can use to search for jobs and career counselors who can help you find jobs, train for a new career and write your resume. Visit the American Job Center website or call 1-877-348-0502 or TTY: 1-877-348-0501 to find an American Job Center near you. State Vocational Rehabilitation (VR) Agencies: VR agencies provide career counseling, job training and job placement services for people with disabilities. Counselors at these agencies work closely with job seekers to help them find, train for and keep a job. Each state has its own rules about who may be eligible to receive these free employment services, so contact your state’s VR agency for more information. Independent Living Centers (ILC): Your local ILC may provide job coaching, training and other services. ILCs can also help you develop skills to live independently, and they often have information about employers in your area who are interested in hiring people with disabilities. State Departments of Labor: These state government agencies provide information on apprenticeship programs, career fairs, resume writing and employment laws. Contact your state Department of Labor to find out how they can help you with your job search. State Governors’ Offices on Employment of People with Disabilities: These offices support the civil rights and independence of individuals with disabilities. They can also connect you to other state government agencies and organizations in your community that provide job training or help with your job search. AbilityOne: This program has a network of more than 600 community-based agencies that provide job training and job opportunities for people with disabilities. AbilityOne’s partners, National Industries for the Blind and SourceAmerica, also have job listings and offer other kinds of employment-related assistance. CareerOneStop’s Job Search Tool: Just enter the type of job you are looking for and your zip code to find job announcements near you. This site also has a tool to find education and training programs where you can earn a certificate or diploma in a profession that interests you. You can search by an occupation, school or program. CareerOneStop’s GetMyFuture website offers job search tips for youth. Additional online job search tools include CareerOneStop’s Business Finder, which lets you browse through more than 11 million employer listings by industry, occupation or name, and My Next Move, which offers information on required skills, salary and job prospects for more than 900 different careers. Under a rule issued by the U.S. Equal Employment Opportunity Commission in January 2017, Federal Government agencies must do several things to increase the number of employees with disabilities. They are required to follow employment goals for individuals with disabilities, provide personal assistance services to certain employees who need them because of a disability, and meet a number of other requirements designed to improve the recruitment, hiring, retention and advancement of individuals with disabilities in the federal workforce. Federal agencies fill jobs two ways—competitively and non-competitively (also called “Schedule A”). Job seekers with disabilities may apply for jobs filled either way. You are eligible for a Schedule A appointment if you are a person with a severe physical or mental disability, and meet the qualifications of the job in question. For more details, read The ABC’s of Schedule A.
USAJOBS: This website is the best place to look for a job with the Federal Government. Start by visiting the site’s “Help Center.” You can also sign up to receive emails about specific types of government jobs that are located in areas where you want to work. Most federal agencies have a Selective Placement Program Coordinator whose job it is to recruit, hire and accommodate people with disabilities at that agency. Many Federal Government agencies, including the Social Security Administration, NASA, IRS, FEMA and the U.S. Department of Justice, have information on their websites about job openings and the efforts they are making to hire people with disabilities. Learn why companies doing business with the Federal Government ask job applicants and employees to voluntarily self-identify if they have a disability by watching this video from the U.S. Department of Labor’s Office of Federal Contract Compliance Programs. The video also explains the important role that self-identifying plays in ensuring equal employment opportunity for people with disabilities. The U.S. Department of Veterans Affairs Veterans Employment Center includes information for veterans looking for a job and employers who want to hire them. The site includes a veterans job bank, resume builder, military skills translator and other career search tools. The CareerOneStop website includes resources and services that can help members of the military and veterans with disabilities with their job search. You can use the site to look for civilian jobs based on your military experience or military occupation code. The National Resource Directory is a web portal for wounded warriors, transitioning service members and veterans. The site’s employment section has information about choosing a career, finding a job, starting a business and getting workplace accommodations. Your State Veterans Affairs Office can connect you to job training programs, as well as education and financial assistance programs in your state that help veterans and their families. Paralyzed Veterans of America’s Operation PAVE offers one-on-one vocational assistance and support to all veterans and their families, as well as assistance to employers committed to hiring veterans. FedsHireVets is a one-stop resource for veterans interested in federal employment. The site explains veterans’ preference, how federal jobs are filled and special veteran appointing authorities that can help you find a job. Get answers to frequently asked questions about veterans’ preference, the federal hiring process and how to get a copy of your DD 214 Certificate of Release or Discharge from Active Duty. Veterans’ Employment and Career Transition Advisor provides important employment information and resources in your state, including contact information for your local Director for Veterans’ Employment and Training, as well as state government jobs. U.S. Bureau of Labor Statistics: This website has information on many different career fields. Just choose a field of study that interests you and view all the possible careers that match it. 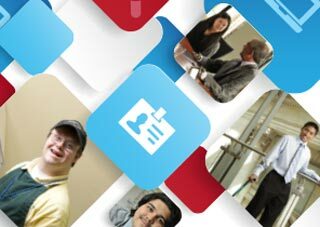 National Collaborative on Workforce and Disability (NCWD/Youth): This site offers information on making the transition from school to work for youth with disabilities. You’ll find resources on youth leadership, job shadowing, mentoring programs, internships and other types of work-based learning. Career Gateway Database: This online tool, offered by Career Opportunities for Students with Disabilities, allows employers to search for qualified candidates, and graduating college and university students to post their resumes. Workforce Recruitment Program (WRP): This program connects college students with disabilities to Federal Government agencies nationwide for internships and permanent employment. WRP works directly with college coordinators, so contact your school’s Office of Student Disability Services for more information. WRP’s video series helps young people with disabilities navigate the job search process. Job Corps: This free education and training program helps young people train for a career, earn a high school diploma or GED, and find and keep a good job. Participants must be at least 16 years old and qualify as low-income. Call 1-800-733-JOBS (1-800-733-5627) or TTY: 1-877-889-5627 for more information. American Association of People with Disabilities (AAPD): AAPD’s internship program provides students with hands-on work experience and mentoring to prepare them for career success. GetMyFuture: This website has information to help young people move from school to work and find careers that fit their interests and skills. Learn about writing a resume, training for a job and starting your own business. You can also look for a job in your area and get contact information for state job programs and agencies. YouthBuild: More than 200 YouthBuild programs across the country help low-income young people ages 16 to 24 work toward their GEDs or high school diplomas while learning construction industry job skills and participating in leadership development activities. American Job Centers: These centers, located in communities across the country, can help you learn about job training programs, financial aid to attend college or trade school and other help training for a job. Visit the American Job Center website or call 1-877-872-5627 (TTY: 1-877-889-5627) to find your local American Job Center. Get information about education and training programs that can help you earn a certificate or diploma in a profession that interests you. GetMyFuture: This website offers job training and employment information for youth. Learn how to find a career that meets your interests and skills and locate job training opportunities in your area. If you’re an adult who hasn’t completed high school, you may wish to take an Adult Basic Education class. These classes are free and held at local school, libraries and community centers. Find an Adult Basic Education class near you. State Vocational Rehabilitation (VR) Agencies: VR agencies provide job training and job placement services for people with disabilities. Vocational rehabilitation counselors at these agencies work closely with each job seeker to help them train for and find jobs. Contact your state’s VR agency for more information. Independent Living Centers (ILC): Your local ILC may provide job coaching, training and other career services. Contact your local Center for more information. Registered Apprenticeships: The Registered Apprenticeship system has been around for over 75 years. Using an “earn while learning” approach, you can get on-the-job-training and mentoring. Get answers to frequently asked questions about apprenticeships. Find apprenticeship programs near you. Contact your state’s apprenticeship agency for more information. You may also want to watch the #ApprenticeshipWorks video to learn more about apprenticeship as a disability-inclusive career path. AbilityOne: This program has a network of more than 600 community-based nonprofit agencies that provide job training and employment opportunities for people with disabilities. Resumes should be well organized, to the point and free of any grammar or spelling errors. They should highlight your job skills, educational achievements and experience. A length of one to two pages is standard unless you have many years of work experience. For help writing your resume, visit the CareerOneStop website to find resume templates and tips on writing cover letters. The GetMyFuture website offers resume writing tips for young people. More help can be found in the Department of Labor’s Return-to-Work Toolkit. The Workforce Recruitment Program’s video, Effective Resumes, also contains helpful tips. Interviews can be stressful. The best way to prepare for one is to practice. The Job Accommodation Network (JAN) has some good interview tips for people with disabilities. Help with education, training and vocational rehabilitation to start a new line of work. SSA’s Ticket to Work (TTW) program helps people who receive SSDI or SSI return to work, or begin working if they’ve never done so. Anyone ages 18 to 64 who receives SSDI or SSI benefits because of his or her disability is eligible to participate. For more information about the TTW program call 1-866-968-7842 (TTY: 1-866-833-2967) Monday through Friday from 8 a.m. to 8 p.m. ET, or search for help in your state on the ChooseWork website. Read “Welcome to the Path to Work” and register for a free Work Incentives Seminar Event (WISE) webinar to learn more about the TTW program. WISE webinars are online events for people who receive Social Security disability benefits and are thinking about going back to work. SSA’s trial work period allows you to test your ability to work while still receiving your full Social Security benefits for at least nine months. During the trial work period, you will receive SSI and SSDI your full benefit amount, no matter how much you earn, as long as you report your work activity and continue to have a disability. In 2019, a trial work month is any month in which a person’s total earnings are over $880. For people who are self-employed, a trail work month is any month in which a person earns more than $880 after expenses or works more than 80 hours. The trial work period continues until you have worked nine months within a 60-month period. If you’re able to work after this time period, your benefits will eventually stop. After the trial work period, you have 36 months during which you can work and still receive benefits for any month your earnings are not what SSA calls “substantial gainful activity” (SGA). For 2019, you can earn up to $1,220 a month ($2,040 for people who are blind) without losing your benefits. SSA also offers employment supports specifically for people who receive SSI. Examples of these include the Earned Income Exclusion, the Plan to Achieve Self-Support and Medicaid While Working. To be eligible for disability benefits, you must not be able to participate in “substantial gainful activity” (SGA). If you work and make more than a certain amount a month, the Social Security Administration (SSA) considers you to be participating in SGA. In 2019, you could earn as much as $1,220 ($2,040 if you’re blind) without losing your benefits. Be aware that if you go back to work, you will need to report your income to SSA. To report your earnings call SSA’s main number (1-800-772-1213) or call, visit or write your local Social Security office. If you receive SSI, you can also use the wage reporting telephone system or mobile application (app). Do You Want to Work & Keep Your Benefits? If you get SSI or SSDI, the Ticket to Work (TTW) program and other work incentive programs can help you return to work. Anyone ages 18 through 64 who receives SSDI or SSI benefits because of his or her disability is eligible to participate in the TTW program. Call the Help Line at 1-866-968-7842 (TTY: 1-866-833-2967), Monday through Friday from 8 a.m. – 8 p.m. ET. Register for a free Work Incentives Seminar Event (WISE) webinar. All employees need the right tools and work environment to effectively perform their jobs. The same is true for employees with disabilities who sometimes need workplace adjustments—or job accommodations—to perform certain job tasks. Job accommodations can include things like screen reading software for employees who have low vision, raised desks for employees who use wheelchairs or job coaching for employees with intellectual disabilities. Accommodations can also include workplace Personal Assistance Services, working from home (telecommuting) and adjustments to work schedules. For more information about job accommodations visit the Job Accommodation Network’s Searchable Online Accommodation Resource (SOAR). Under the Americans with Disabilities Act, an accommodation is considered any modification or adjustment to a job or work environment that enables a qualified person with a disability to apply for or perform a job. Most accommodations don’t cost much, but result in many benefits. According to JAN, more than half of accommodations cost employers nothing. Of those that do have a cost, the typical one-time expenditure is $500—an expense that most employers say pays for itself many times over through reduced insurance and training costs and increased productivity. JAN provides free, expert and confidential guidance about workplace accommodations and disability employment issues, including employment laws and regulations. Find information on reasonable accommodations for employees with disabilities and the Americans with Disabilities Act. Resources are also available in Spanish. Check out JAN’s website for information about many different types of job accommodations based on the type of disability. JAN has information on accommodations for employees with all types of disabilities, including mental health disabilities and other invisible disabilities. For more information, call 1-800-526-7234 (TTY: 1-877-781-9403). Title I of the Americans with Disabilities Act (ADA) prohibits private employers, state and local governments, employment agencies and labor unions from discriminating against qualified job applicants or employees with disabilities. It covers areas such as job application procedures, hiring and firing, promotions, wages and compensation and job training. The ADA also covers things like what questions employers can ask about your disability or medical condition during an interview and what pre-employment medical tests they can require you to take. One of the key aspects of Title I is the legal requirement to provide reasonable accommodations for employees and job seekers with disabilities. Accommodations make it possible for a person with a disability to perform their job, but they must not create an “undue hardship” for the employer—in other words cause too much difficulty or expense to implement. What are some examples of reasonable accommodations that may be needed during the hiring process? They can take many forms, including providing written materials in accessible formats, such as large print, Braille or audiotape, or readers or sign language interpreters. Title I also prohibits employers from retaliating against someone who objects to employment practices that discriminate based on disability, or for filing a discrimination charge under the ADA. This section of the ADA is enforced by the U.S. Equal Employment Opportunity Commission (EEOC), and it applies to employers with 15 or more employees, including state and local governments. The EEOC website has fact sheets about how the ADA applies to employees with certain types of medical conditions, such as cancer, diabetes and epilepsy. A helpful tool for employers is the U.S. Department of Labor’s Disability Nondiscrimination Law “elaws” Advisor. This “advisor” walks you through steps to find out which federal disability nondiscrimination laws apply to your business or organization. Title I of the ADA is one of several laws that protect the employment rights of people with disabilities.